Welcome to the Marché Special Edition of Cook Create Celebrate! 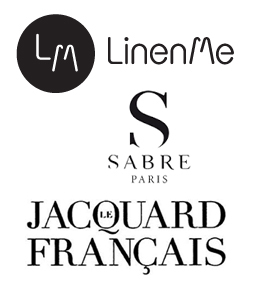 This month we are celebrating Marché! Jill sets the stage with a special note on her vision and excitement about the new space opening three doors down at 496 Main on Tuesday, October 27th. We are anxious to introduce Marché general manager, Daniel Sirko, and highlight all of Marché's offerings! Back at Marcel's, take note of a trunk show featuring three of our favorite brands and a very special Anniversary Cocktail Party with Anupy Singla honoring 90 years of the iconic Le Creuset. An assortment of Halloween classes for kids is sprinkled in our October class calendar. 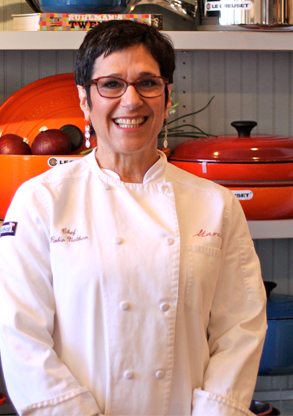 We are also excited about a new Food & Wine Pairing series with Chef Robin Nathan. 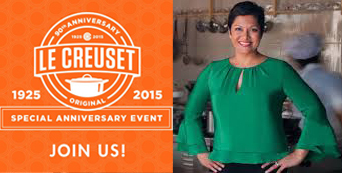 Join us for an exclusive event with cookbook author Anupy Singla celebrating 90 years of Le Creuset! Anupy, the author of three cookbooks, is fast becoming one of the country's foremost authorities on Indian food and cooking. Along with joining Anupy in the kitchen for interactive demonstrations featuring the new World Cuisine cookware, celebrate 90 years of the iconic Le Creuset with gifts for all, exclusive anniversary products for sale, and delicious food, wine, beer and other beverages. This is special event at a very special price of only $25! Don's miss it! Calling all ghosts and goblins! Check out our fun assortment of themed classes leading up to Halloween for Little Kids, Mid Kids and Big Kids. Join the annual Glen Ellyn Halloween Parade on the 31st, sponsored by the Glen Ellyn Chamber of Commerce. Parade steps off at 10:00 am from Prairie Path Park. 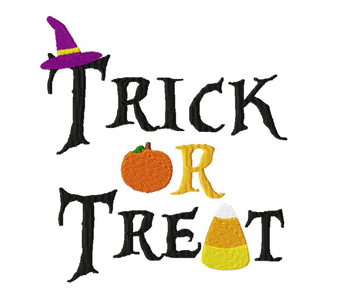 Then trick or treat at participating merchants along the streets of downtown Glen Ellyn until 2:00 pm. Don't forget to visit us at Marcel's! One store is really enough. Really. Fulfilling, demanding, successful, beloved - why mess with that? But I got this bee in my bonnet a couple of years ago and I started thinking about cheese shops. Then I started going to cheese shops. And I couldn't help but think there was a place for a great cheese shop in downtown Glen Ellyn. Since I am sort of prudent, even with a bee in my bonnet, I decided to test it out. Put the refrigerated case in at Marcel's, fill it with cheese and meats and some other goodies and see what happens. Would customers buy these things from us when there are six big grocery stores with big cheese departments within a few miles of here? It turns out they would and you did! But we are so limited in what we can sell -- I really needed a space to do this properly. Then good karma enters the story: in August 2014 the owner of the building at 496 N. Main Street was ready to close her business and sell her building. It's the perfect spot - beautiful corner location, gateway into Glen Ellyn, steps away from Marcel's and right on Main Street. I reassembled the expert team who created Marcel's (Beth Howley, Lisa Sallwasser, Jay Murray, and Michelle Thorsell) and we got to work. The second best thing that happened (after the building) was meeting Daniel Sirko. You can read all about him below and you will meet him soon. I am still pinching myself that he wanted to join us - I am blown away every day by his knowledge. Now we are assembling the Marché team, finishing the construction, getting all of our product ordered and we expect to be open by the end of the month. We have adopted the best ideas from all of our research and experience, put them into a warm, inviting, cozy space, and are ready to be your destination for all things cheese. We are so excited. Two stores is really enough. Really. Let our staff be your tour guides as you wind your way through our cheese cases, take in the charcuterie and explore our carefully paired spirits and accoutrements. Whatever the occasion we’re ready to help. Our Party Boards will stand out at any gathering for home, office, tailgate or holiday get-together. Eat in. To go. To share. Or not. Stop in for our made-to-order cheese plates and a chilled craft beer. Or white wine. Or red. We’re ready. Carefully crafted boxes featuring classics, Midwestern favorites or inspired selctions from around the globe. Our selection will satisfy the most discriminating tastes. Here’s your chance to join “The Culture Club” – Marché’s inquisitive group of curd loving, flavor seeking subscribers exploring the renaissance of great artisan cheeses. 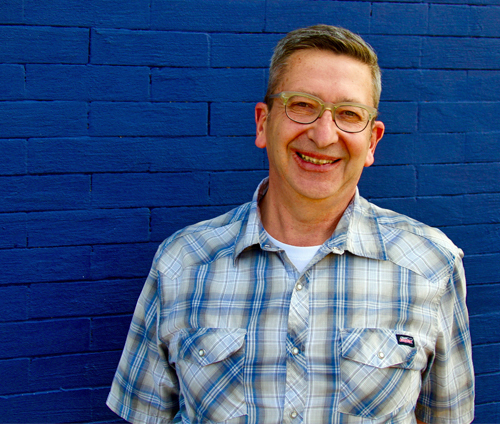 Daniel, a longtime Chicago area resident, has more than two decades of specialty food and restaurant management experience. Most recently he was general manager of Kaufman’s Delicatessen and Bakery in Skokie. Earlier he was a founding owner of Chicago restaurant Birchwood Kitchen and Second Street Market in Highland Park. He also helped launch Pastoral Artisan Cheese, Bread and Wine, and Fox & Obel Food Market, both in Chicago. You are hosting a fall dinner party - what's on the menu? I’ve been into Yotam Ottolenghi’s amazing cookbooks lately so something inspired by him. For starters, herbed fish cakes with zaatar yogurt and a butternut squash hummus with pomegranate molasses. Entrées – roasted eggplants with ground lamb and pine nuts and an amazing roast chicken with fennel and oranges. On the side, a wilted spinach salad with Medjool dates and almonds. That’s an explosion of flavors. And there’s usually a cheese course with seasonal fruits – apples and pears right now. And then just a bite of dark chocolate something. Wanna come? Make the best mac n' cheese – Probably Gruyere, with a little grated Parmigiano Reggiano on top. 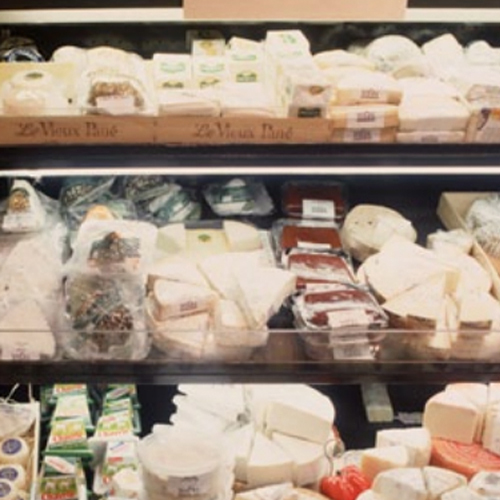 Advice for a cheese "novice" who walks into Marché: Don’t be afraid to be inquisitive – we love talking about cheese. Three weeks, three countries, four wine regions and the foods to pair with them! This series will explore the wine growing regions of California, Italy, Bordeaux and Burgundy, pairing the best in the glass with the best on the plate. This class is tailored to the wine novice as well as the wine enthusiast as Chef Robin explores the world of the grape. You'll learn the fundamentals of wine, wine tasting, and appreciation, and judging wine color, aroma, flavor, and body. 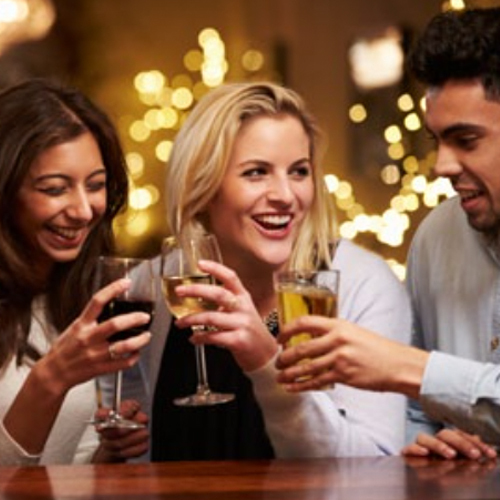 You'll understand the secrets hidden on wine labels, and discover the meaning of such concepts as dryness, acidity, fruitiness, tannins, varietals, vintages, and how and why the wine you drink pairs with the food you eat. California is a gorgeous, diverse state offering a little something for everyone. Because of its incredible wine offerings, it's the perfect destination for our first night of tastings and learning. In this class, we will divide the evening into two parts: 'The North: Napa, Sonoma, Mendocino, and More,' and 'The South: Santa Barbara, Paso Robles, Monterey, and More.' We'll taste each area's wines all along the way. The class will also enjoy sampling regional foods that prove the old pairing adage, 'If it grows together, it goes together." Sauvignon Blanc, Chardonnay, Pinot Noir, Merlot, Cabernet Sauvignon, Zinfandel. Filet Bites with Blue Cheese Vinaigrette and Peppered Cranberry Sauce. Italy is home to some of the oldest wine-producing regions in the world, and Italian wines are known worldwide for their broad variety. Italy, closely followed by France, is the world's largest wine producer by volume with grapes grown in almost every region - but that doesn't make it any easier to understand the difference between a Chianti and a Sangiovese (the same thing!!) or what to pair with Italy's aggressively acidic wines. 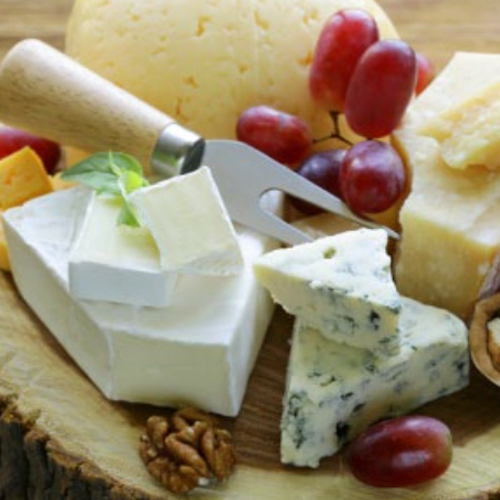 Some of life's simplest and tastiest pleasures come straight out of Italy, taste why! Fruili/Veneto, Orvieto, Frascati, Valpolicella, Chianti. The two biggest wine growing regions of France, Burgundy and Bordeaux have long and honored wine traditions, with vines under cultivation since the 3rd century. The Burgundy growing region has the largest number of AOC (appellations) of any in France, and grows predominantly pinot noir and chardonnay grapes for their red and white wines. The Bordeaux region specializes in blends for their red and white wines. In this class, we will compare and contrast these wines and flavors contributed by terroir of what many consider to be the most complicated and confusing of the world's growing regions. 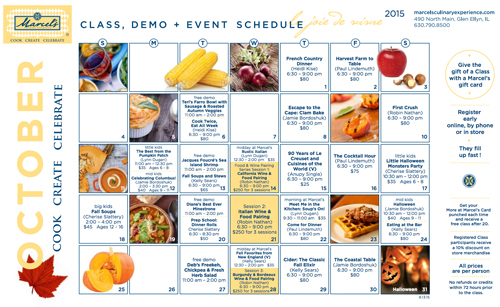 Click on the calendar to explore all of our October classes!